Oh, I know, I lost my topknot! Look at what great genetics can produce. Color in the backgraound with his sire, Donovan and Mr. President on the dam side. Atlantic Breeze Impact is an impressive male. Perfect bite, conformation and a fleece that has a wonderful handle as evidenced by his histogram. 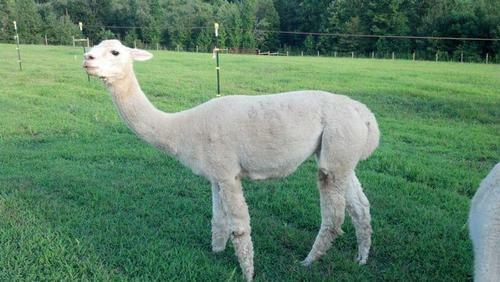 Antigeon is one of the reliable foundation herd dams at Atlantic Breeze Alpacas. Antigeon is one of the few Peruvian Auzengate descendents in the USA. The Auzengate claim to fame is the "rolling skin" characteristic. As a granddaughter to this famous male, Antigeon's fleece is superb! 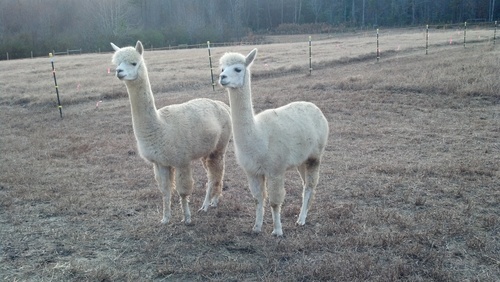 Plus, all of her offspring possess the fine handle and density that we look for in a quality alpaca. Great looking young lady! Impeccably square and a beautiful fine fleece. Her sire is Atlantic Breeze Impact, a Donovan son. Accoyo Mr. President is on the dam's side of Impact. The proof is in the offspring and this gal shows it off well. Her dam, Antigeon, is one of very few Auzengate lines that features the "rolling skin" characteristic. PPPeruvian Augusto, PPPeruvian Mr. President and PPPeruvian Argonne are also in her background. She has developed nicely and has a sweet disposition. We have done her a disservice by not promoting her more. Afternoon's fiber is extremely fine (17 micron at last count) and cool to the touch with a nice luster. 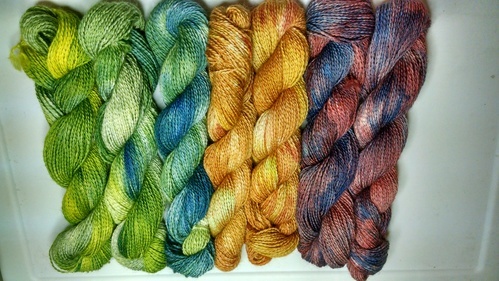 It processes into a gorgeous lightweight yarn that sells and dyes well. 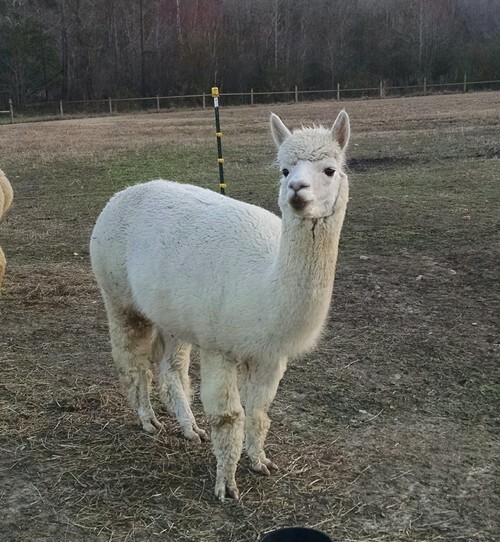 At five years old, she took second place in the 2015 Carolina Alpaca Celebration handcrafter's spinoff showing that she is retaining good fiber quality. 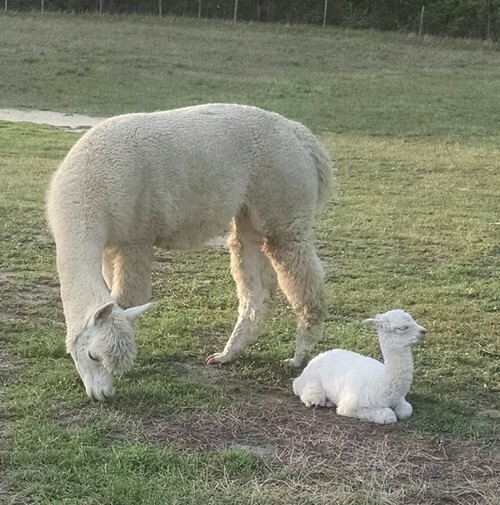 Even though we have had great success with her fiber, we are now in the process of making some business changes by adding more color diversity to our herd (which is almost totally white) and is why we are selling her at such a low price. You could recoup her cost from the sales of roving and yarn made from her fleece. She is an affordable fiber/pet/companion that adds a lot of serenity to the herd--she isn't bossy or pushy. Although she is proven, she would need the expertise of experienced breeders. Afternoon is also available for trade.